To wrap up this holiday weekend, SuperPhillip Central has a new review to share for a game that released last month in North America. 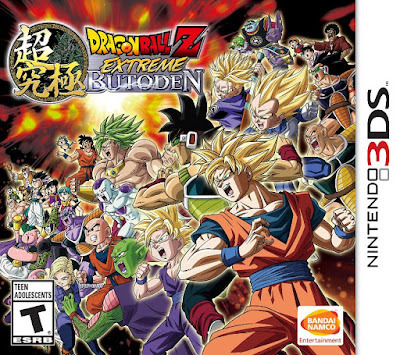 It's Dragon Ball Z: Extreme Butoden for the Nintendo 3DS. Here is SuperPhillip Central's review. For the longest time I've had a love-hate relationship with the Dragon Ball Z franchise. 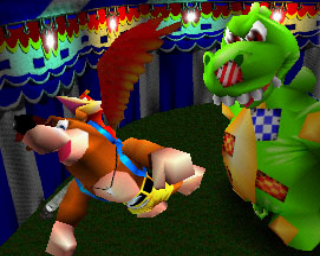 For one, I really enjoyed and loved playing the games, no matter if they were 2D or 3D fighters, or something else completely out of left field. Collecting figurines as my younger self was also an entertaining hobby. However, the actual anime, at least the original version with all of its filler, was a show that was a bit difficult to watch. Thankfully, Dragon Ball Z Kai is doing a lot to fix the issues I had with the original anime. Once more, a new Dragon Ball Z game enters the gaming atmosphere, this time landing on the Nintendo 3DS of all platforms. Though the system was rich in fighters in its early life, lately the fighting game scene is one that has avoided the platform. With Dragon Ball Z: Extreme Butoden, the Dragon Ball Z fighting game series reaches the 3DS with a Kamehameha Blast of epic proportions. Krillin is here today to show that size doesn't matter. Dragon Ball Z: Extreme Butoden sports three main modes for solo players of the game. These unlock one after another as they are completed. The first, Z Story, puts players in the shoes of various Z fighters, each with their own ten fights to complete, taking place throughout the Dragon Ball Z story arc. This is from the Saiyan Saga to the Majin Buu Saga. My personal favorite of the modes, and that's because of how much more expansive it is, is Adventure Mode. 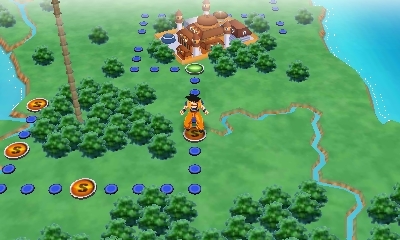 In Adventure Mode, you take the role of Goku who has to collect seven special Dragon Balls in order to combat the return of a plethora of old villains from Dragon Ball and Dragon Ball Z. To do this, you travel across eight unique maps, doing battle with AI opponents, and depending on how well you do in each fight, you earn items and new assist characters to your arsenal. Getting an S rank in a fight depends on whether you fulfill the mission's conditions (e.g. finish a foe with an Ultimate Combo, beat the opposing side within a specific amount of time, and so forth) and if you reach 400 points or more through doing a mix of Super Combos, summoning assist characters, and getting Rush Combos, multiple hits on an enemy at once. An example of one of the maps used in Adventure Mode. Finally, there is the Extreme World Tournament that unlocks after Adventure Mode's eight maps have been completed. This mode pits your team of fighters and assist characters against a series of tough opponents. The difficulty here ramps up considerably, but through beating the mode and taking down each team of fighters put in your path, you become the Extreme World Tournament champion. This unlocks the final of 25 characters within Extreme Butoden. 25 characters might seem like a small amount, especially when compared to the 3D games, where we've definitely been a bit spoiled. However, the variety of characters in Extreme Butoden is rather high, and considering how the game uses 2D sprites for the fighters and assist characters instead of 3D models, it's easier to understand why the number of fighters is considerably less than the console games. Such combatants this go around include mainstays like Goku, Gohan, Piccolo, Vegeta, Trunks, and Krillin, plus villains like Raditz, Nappa, Frieza in his final form, Perfect Cell, Android 18, Majin Buu, and more. Do androids dream of electric Saiyans pounding them in the jaw? 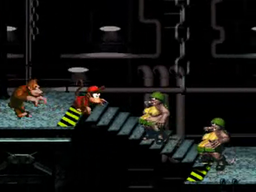 Speaking of characters, a typical battle allows up to three characters to be selected for a round. If you don't wish to utilize a team of three fighters, you can opt to add assist characters to your ranks. There are six potential slots to select characters to, and each fighter you choose takes up two of those slots. Meanwhile, an assist character takes up one slot. These assist characters are summoned into battle by tapping their icon on the touch screen in mid-fight, having an alternate result depending on the character summoned. 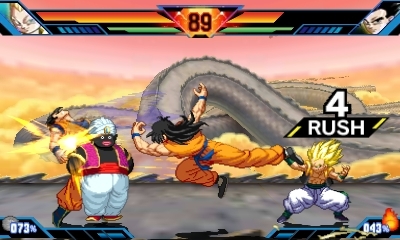 For example, while Yamcha performs a Wolf Fang Fist, Dende partially heals the player's life bar that summoned him. There are approximately 100 different assist characters to choose from, the majority of which need to be unlocked in Adventure Mode. They range from well known characters like Goten, Great Saiyaman, Videl, and Recoome to lesser known characters in the Dragon Ball lore like Monster Carrot, Gine, and Hirrudegan. of battle... or to ensure victory. Extreme Butoden isn't a complicated fighter by any stretch of the imagination. Each fighter uses the same button combinations as one another, making it so you need not remember dozens upon dozens of button inputs to be a proficient fighter. Like a typical 2D fighter you have buttons for a weak attack, strong attack, and for Extreme Butoden, a special attack. Pressing different combinations of these buttons results in varied moves, such as Strong Combos, Blast Combos, Z Combos, Z Cancels, Super Combos, Neo Combos, and a myriad of others. When more than one fighter is on a team, you can switch between them on the fly with the touch screen. Of course, like using assist characters, there is a cool down period before a fighter can return to battle. 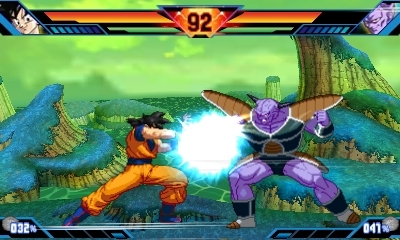 Each fighter has a Spirit Gauge which dictates how much energy can be used on special attacks that utilize Spirit, such as Goku's Kamehameha Blast and Vegeta's Galick Gun. The maximum a Spirit Gauge can ordinarily reach is 150%, but when a side's health gauge is at less than half, this can expand to 200%, allowing for greater moves and abilities in combat. Different moves take off different percentages of the Spirit Gauge, but the amount of the gauge can be restored through attacking the opponent as well as powering up via holding down the R button. Goku gives a Kamehameha Blast up close and personal to Captain Ginyu. Ultimate Combos use 100% of the Spirit Gauge, and these are the best, most powerful attacks within Extreme Butoden. The timing at first to set your opponent up to unleash these takes a bit of practice, but once the button combination and timing are learned, these become second nature. With an Ultimate Combo, a Super Special Move is let loose, If the player on the receiving end of the Ultimate Combo has at least 150% in their Spirit Gauge, they can counter the attack. 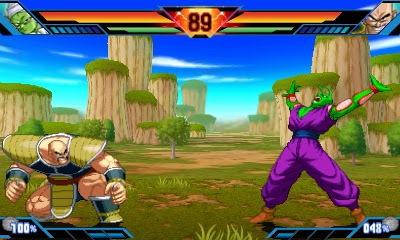 What results in this is two giant beams of energy jockeying for position, having both players mash on the face buttons to overpower the other. These sequences are highly dramatic, but at the same token, they take some time to unfold, slowing down a battle immensely, which can be a bit of an annoyance. but they get annoying after the tenth time seeing them. Although the solo modes will last players a decent amount of time (10-15 hours), what's left after that is not much. There is a mode to play battles against CPU opponents using characters selected by the player, but beyond that, the pickings are quite slim. If you somehow find a friend or other 3DS owner with a copy of the game, you can fight them via local play. However, online play is completely missing, which is quite unfortunate. That said, a patch in Japan is bringing this much requested feature to players in the near future. There is no telling if the patch will hit Western shores. Extreme Butoden sports extremely well articulated and detailed 2D sprites, showing Arc System Works at its finest. The amount of different animations and poses for each of the game's 25 fighters and 100 or so assist characters is extraordinary. 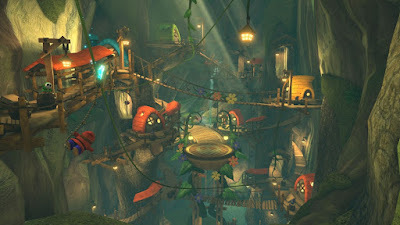 The game uses 3D backgrounds that house some impressive features to them as well. The 3D effect of the Nintendo 3DS for this game is pretty tame. The Spirit Gauge is the sole piece of the game's graphics that stands out while everything else on the screen looks as if you're looking into a box. I wish there was more depth in the 3D effect, such as characters and the foreground popping out at the viewer against the backgrounds and environment. 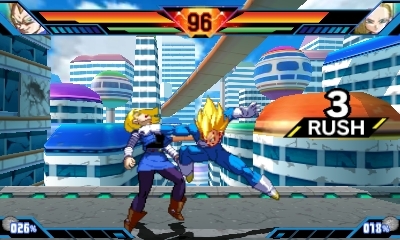 The music is comparative to past Dragon Ball Z games, featuring the token amount of rock and tense music for battles. Unfortunately, the English cast of the series is not represented in Extreme Butoden, only offering the Japanese cast instead. 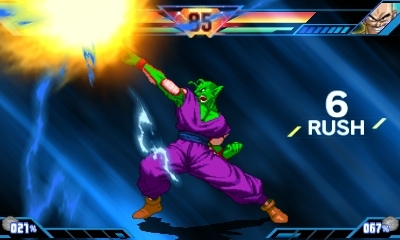 Piccolo isn't preparing a special move. He's just showing off with a pose. 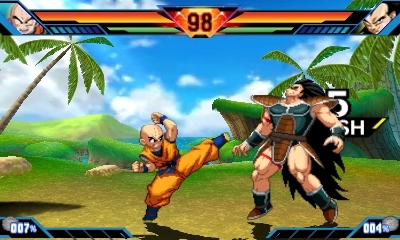 Dragon Ball Z: Extreme Butoden is a capable fighter that houses the same intensity of battles as seen in the show the game is modeled after. The lack of current online play is definitely a shame, but the single player components and $30 price tag make up for it in some regards. Despite being a 2D fighter for both beginners and veterans of the genre alike, a great amount of depth and skill is here for those who seek it. 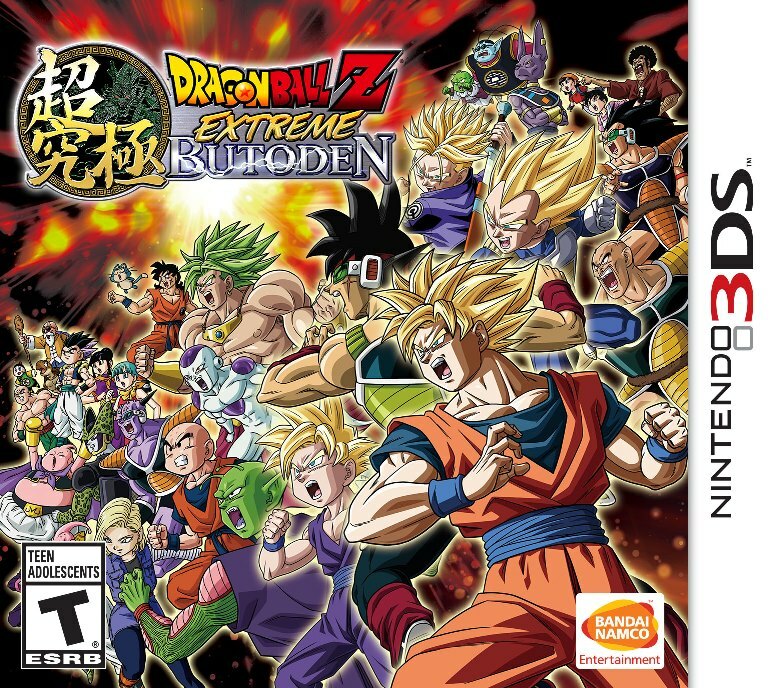 Big fans of Dragon Ball Z will find a lot more to love than non-fans, but if you're in the mood for a compelling fighter, then Extreme Butoden might just be the game for you. Thanksgiving is tomorrow in the United States, where SuperPhillip Central is headquartered. The next game to be reviewed seems like a perfect one for casual and core gamers and family members to sit around the TV after a big turkey dinner to enjoy together. It's Word Party, and here is SPC's review. From the creators of Word Search by POWGI, Lightwood Games is back with another word-oriented wonder for the Wii U eShop. This time the studio's offering moves away from the single player experience of playing word searches and goes towards the mayhem that is known as local multiplayer with Word Party, sporting 28 unique mini-games for up to six players to enjoy. Does this party disappoint, or does it deliver beyond words? 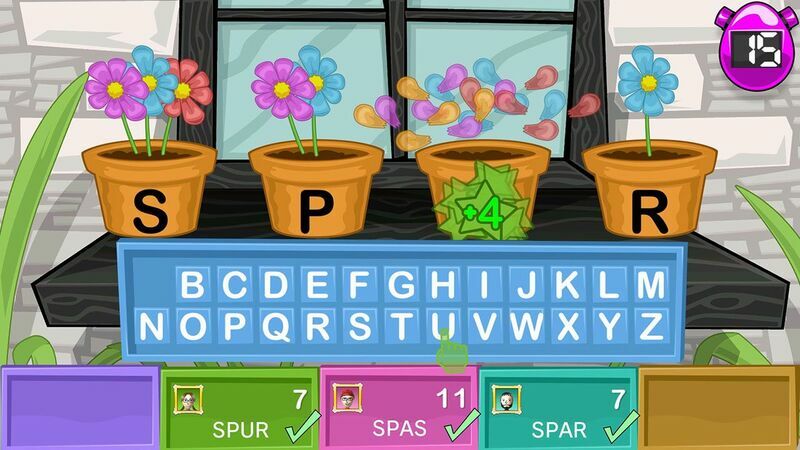 Word Party sports a robust amount of mini-games, and as you can probably suspect, all of them relate to words in some form or another. All games utilize the Wii Remote as the main controller for inputs, and you use the IR functionality to point at the screen to choose from menus and make selections. more flowers in them will earn you more points. The games have great variety to them. 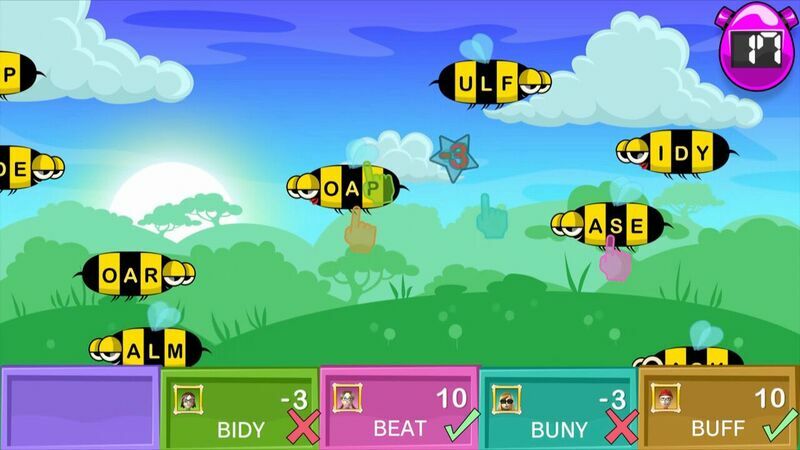 Some games task you with clicking on the right bee among a horde of them with different three letter combinations on them like "ill" or "uoy", making sure the one you click on forms a word that begins with the letter "B". 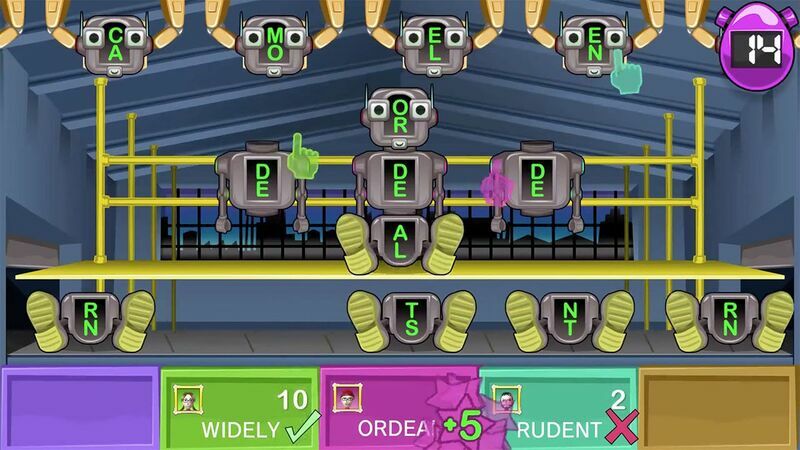 Other games have you pointing at magnetic letters on a refrigerator door, creating words up to six letters; competing in a word search where the player that finds the most words is deemed the winner; and a multiple choice game where you click the word the definition in the center of the screen is describing. that will spell out a word beginning with "B" to earn points. 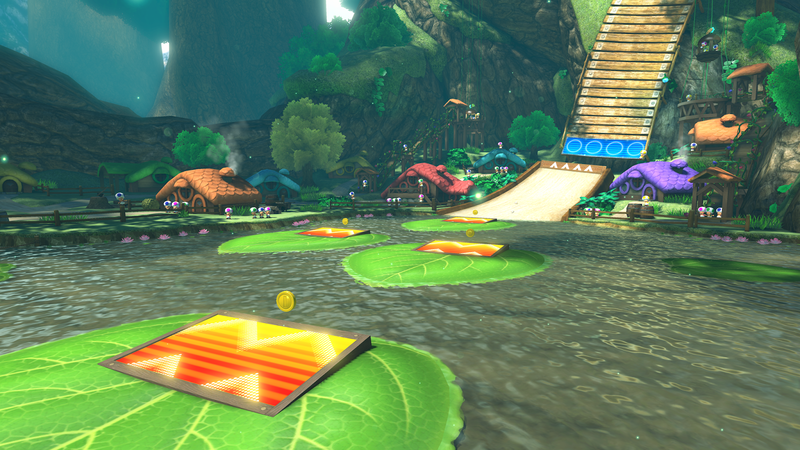 Starting off, you have a selection of 14 mini-games that are randomly chosen from in the standard play mode. The play mode chooses a handful of mini-games in a random order for up to six players to play. 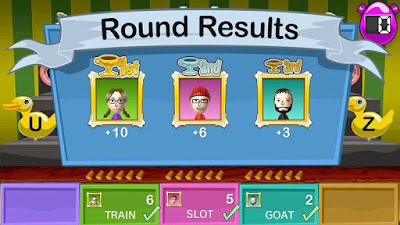 Points are earned each round based on each player's position in a given mini-game. For example, 1st gets 10 points while 2nd gets a little less, and so forth. The winner of the multiplayer match is the one with the highest number of points at the end of all of the randomly chosen mini-games. 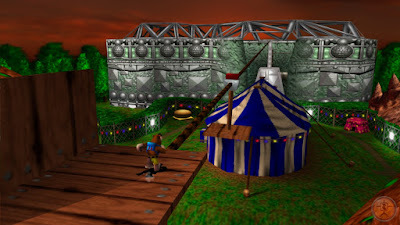 If you wish to just play mini-games from YOUR choosing rather than the game's own selection, you can play practice mode. This gives you the opportunity to replay mini-games however many times you want without waiting for them to pop up in the game's rotation in play mode. That notwithstanding, if you want to unlock mini-games, you'll have to go through the somewhat tedious process of playing multiplayer games in play mode over and over again. It's unfortunate because half of the mini-games in Word Party is locked up content that you have to satisfy conditions to open up for play. This robot building game is one of the more challenging ones in Word Party. 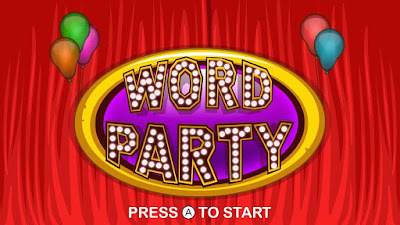 Furthermore, each round in Word Party in play mode is rather short, lasting at most 30 seconds. Many times our multiplayer fun would be short lived because the round would be over before we knew it, making us want more. It would have been nice to see options allowing for beefing up or selecting the time limit for the mini-games, so our word party wouldn't be over so fast each round. 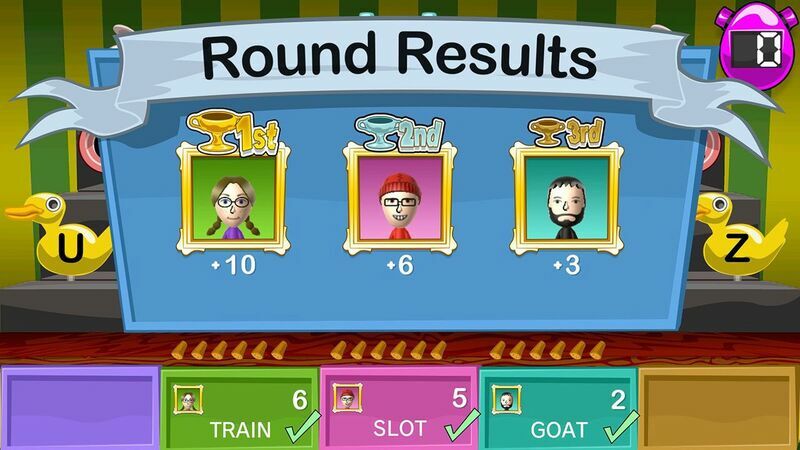 Word Party sports a charming art style and a pleasant user interface. The ability to use Miis for player icons make for an additionally nice touch. By no means is what is shown on screen during menus or mid-mini-games mind-blowing, but the art direction and cute style gets the job done, adding to the festive personality of the game. The music is suitably bouncy and upbeat, though it's nothing that you'll want to listen to outside of the game. their position in the last mini-game played. If you like word games like crossword puzzles, word searches, definition games, etc., don't mind the double digit price tag, and you have at least two players to share the experience with, then Word Party is an enjoyable game. 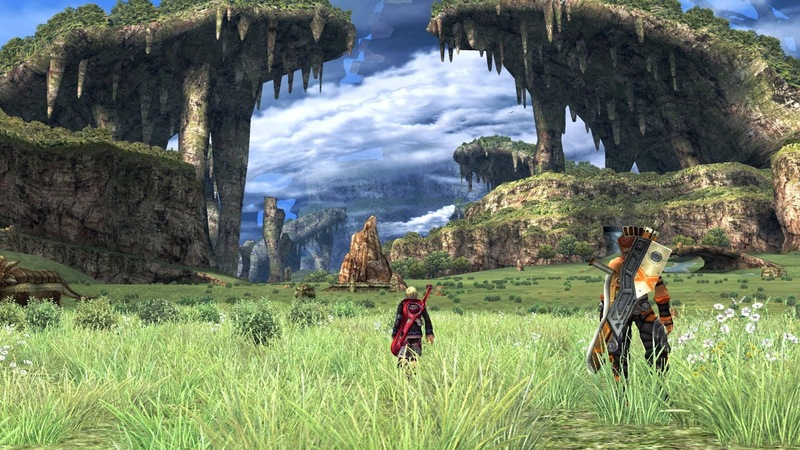 It's decidedly not for everyone, but it's also a game that serves its niche well. 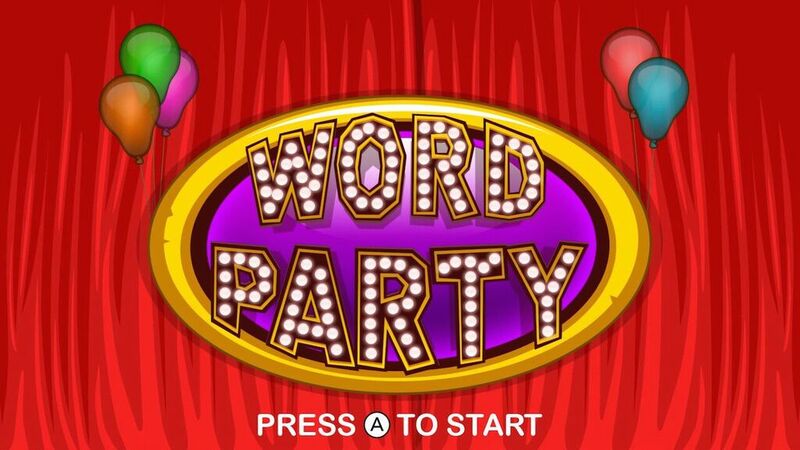 If you like to party hearty with words, it only makes sense to look into Word Party. With that, let's get to ranking these games! The original Super Smash Bros. kicks off this countdown of Smash Bros. supremacy. This is Smash at its most basic, offering a modest selection of characters (eight to start with, four to unlock), a fun assortment of stages, and several modes to enjoy like the amazing Classic and Target Blast modes that would return in future installments. This was the beginning of something very special for Nintendo and its fans, and the original Super Smash Bros., like every other game in the series, is worth playing for multiplayer fun even to this day. 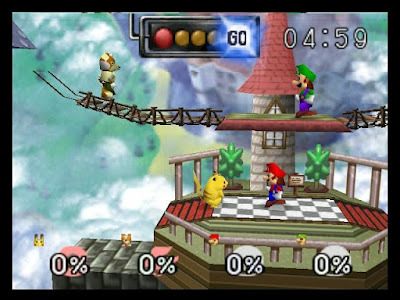 The first and only Super Smash Bros. game on a handheld, Super Smash Bros. for Nintendo 3DS broke new territory and blew minds as Masahiro Sakurai and his team successfully converted the console gameplay of past Super Smash Bros. games to the small screen with almost everything you'd want from the series intact. The same arsenal of characters from the Wii U version were all available for play without much in the way of making concessions. 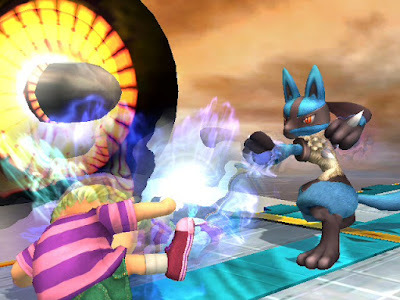 Smash Run was the exclusive mode for the 3DS version, and it offered a maze-like dungeon of enemies to defeat to get your character stronger for the final round, a match of some kind against AI opponents. The stage variety was quite good, too, delivering well designed stages like The Legend of Zelda: Spirit Tracks' train, Nintendogs' Living Room, and Fire Emblem: Awakening's Arena Ferox. While it's not a game that competitive players went to in droves, Super Smash Bros. for Nintendo 3DS is a wonderful Smash Bros. game that feels complete and great to play on-the-go. It seemed like we were waiting ages for the Wii's Super Smash Bros. game to be released, constantly getting teased with new information every weekday with the Super Smash Bros. Dojo website. When the game finally came out, it was a mixed blessing, more of a positive one than a negative one, though. Packed with amazing stages with seldom a stinker in the bunch, an incredible amount of characters with such newcomers as Wario, Kid Icarus's Pit, Kirby's Metaknight and King Dedede, as well as a first for the series, third party characters like Sonic the Hedgehog and Solid Snake of Metal Gear Solid fame. 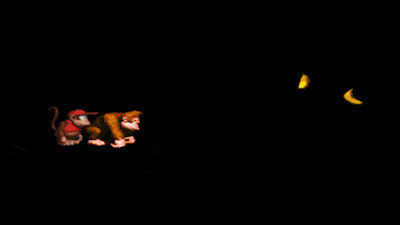 Super Smash Bros. Brawl featured a campaign with it with engaging and charming cutscenes, allowing for up to player to join in on the 2D side-scrolling levels. The amount of content in Super Smash Bros. Brawl is amazing, and that fact is something that is a tradition with the series itself. However, not all was great with Brawl. One issue that ruined its chances as a competitive title was the inclusion of tripping. While great for a party game, not really well suited for tournaments. Still, for the millions of people who just enjoy the games as Nintendo fighters and not the small number of players who seek a tournament-caliber competitive game, Super Smash Bros. Brawl was a legitimately great game. 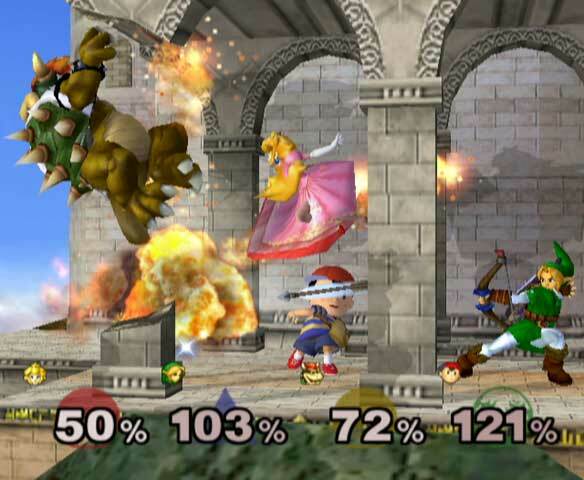 This next Super Smash Bros. game, Melee, is still played competitively and enjoyed by players all over the world. It says a lot about the legacy of this near-launch GameCube title. 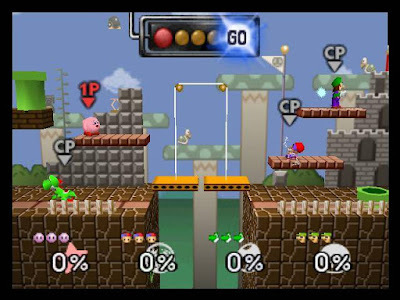 What I enjoyed about Super Smash Bros. Melee was how it really began the content-packed tradition that games following Melee would possess. Melee saw the introduction of trophies, a collectible that showed well known and forgotten characters, items, settings, and objects with wonderful descriptions. It was a virtual museum and shrine of Nintendo. The solo mode, Adventure, continues to be my personal favorite single player mode of any Smash game, taking players through familiar Nintendo settings like the Mushroom Kingdom, a Legend of Zelda temple, and even an F-Zero race track. 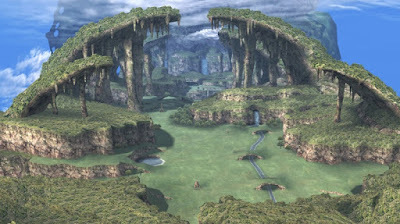 The stage design is some of the series' best without a doubt, offering great locales like the Fountain of Dreams, Mute City, Temple, Kongo Jungle, and so many others. Then there is the cast of characters that introduced Fire Emblem as a series to the West and brought memories of Nintendo's Game and Watch systems back into the limelight (or for many, the first time ever). 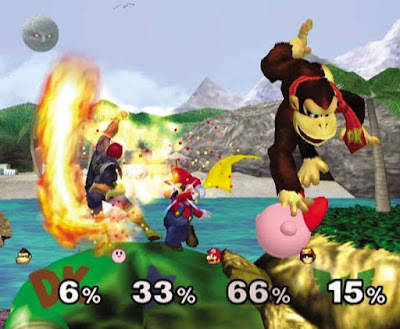 Super Smash Bros. Melee is the complete package, but at the same time, it's not the best that the Super Smash Bros. series has to offer. The latest and what SuperPhillip Central considers the greatest Super Smash Bros. game is the recently released Wii U sequel. Although its board game mode isn't the best, everything else more than makes up for it. Everything including the largest roster of Super Smash Bros. characters ever to be contained in one game-- from Nintendo staples like Mario, Donkey Kong, Link, Samus Aran, and Pikachu, to third party greats like Mega Man, Sonic the Hedgehog, Pac-Man, and now even Street Fighter's Ryu and Final Fantasy VII's Cloud Strife. The immense amount of excellent stages with plenty of dynamic hazards and obstacles to concern yourself with give them as much character as the fighters you battle with. 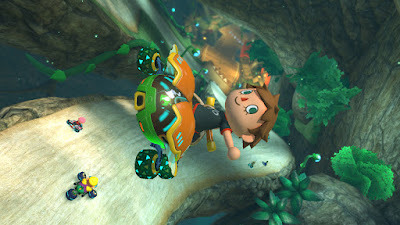 The variety extends to the game's many modes like returning delights like Classic mode, All-Star mode, Event mode, Special Orders, Multi-Man Smash, Target Blast, Home-Run Contest, and Trophy Rush. 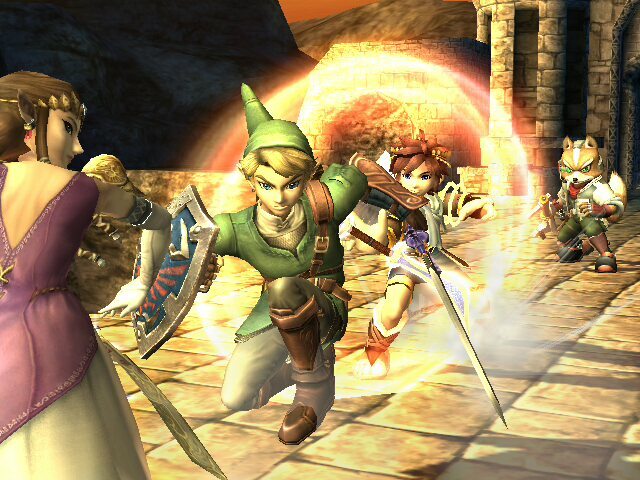 The addition of mostly lag-free online play (something that Brawl sadly balked on) makes it easy to join up and play intense battles for up to four players over the Internet. Finally, the creation of Omega versions of stages makes it so the Battlefield and Final Destination aren't the only backdrops competitive players will have to put up with, as all stages now feature a Final Destination version. Super Smash Bros. for Wii U is the most content-rich, enjoyable to play, and magnificent Smash Bros. game to currently exist. Once again, Masahiro Sakurai and his team delivered sublimely. As a fan of a handful of Gundam series, it is with disappointment that I present to you this Better Late Than Never review. It's for Dynasty Warriors: Gundam 3, a game that visually looks striking-- at least the mobile suit part. Unfortunately, it takes more than beautiful cel-shaded mobile suit models to impress SuperPhillip Central. This review shows just that. Gun...damn, is this game repetitive! Last year I had the great experience of playing Hyrule Warriors, a Dynasty Warriors style game that featured The Legend of Zelda. Its gameplay and content were both quite excellent. 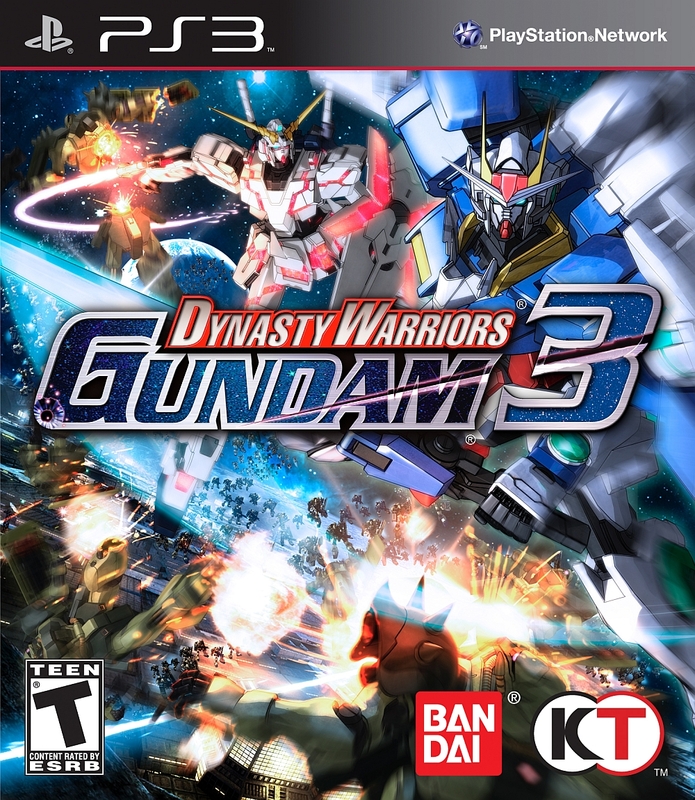 Perhaps I should have lowered my expectations when entering another game with the Dynasty Warriors moniker, Dynasty Warriors: Gundam 3. Instead of a game that could easily be played for 50+ hours without complaints, I received a game that just would never end. I constantly wished for the massively boring and worthless story to be told to be over, thinking the game could go screw itself after fake ending after fake ending. 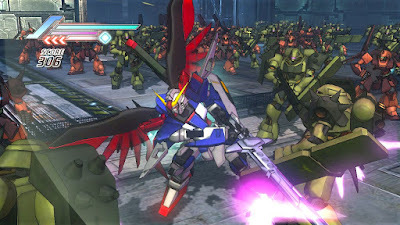 Sadly, Dynasty Warriors: Gundam 3 is a turkey of a Dynasty Warriors game. 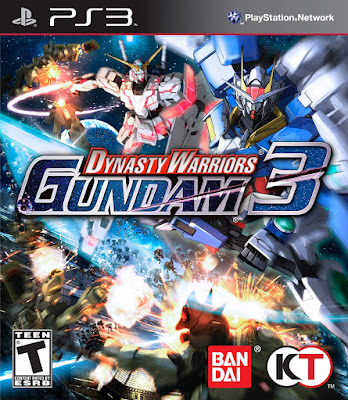 The story of Dynasty Warriors: Gundam 3 takes all of the familiar and even unfamiliar pilots and characters across numerous Gundam series and puts them into a parallel world. The goal is to find their way out of this world, forging new alliances and participating in battle after battle until the whole thing gets horribly repetitive and wears out its welcome. I couldn't tell you much else about the story other than I was more than glad to just mash the X button to fast forward through the insanely cheesy dialogue. That was only after subjecting myself to some of the most inane discussions I've had to witness in quite a while. I know this is anime and all, but seemingly every conversation led nowhere or was the same thing only with different characters. "Oh! You're in this parallel world, too? How did you get here?" "I don't know. I'm going to tell you the last thing I did before I was transported to this world, and it's going to be similar to the fifty-six other characters' tales. Now, let's have forty more lines of dialogue that is positively aimless in order to annoy Phil." 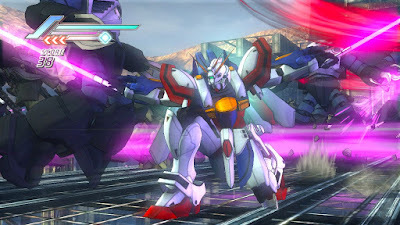 While the story and especially the dialogue are better left for a high school drama student's audition, the presentation of Dynasty Warriors: Gundam 3 gets points for being visually interesting, if only for the stars of the game, the mobile suits.. The amazing cel-shaded look of mobile suits really is eye-catching and look brilliant. Sure, everything else isn't very compelling, especially texture-wise, but at least what you control and you destroy look great. The music borrows some themes verbatim from past Dynasty Warriors: Gundam games, but that music wasn't bad by any stretch of the imagination to begin with. If it ain't broke, right? The mobile suits are indeed the star of the visual show. Dynasty Warriors: Gundam 3 is a cruel temptress. It promises a game packed with countless missions to complete, but they end up all being so similar to one another that one has to ask what the point is. 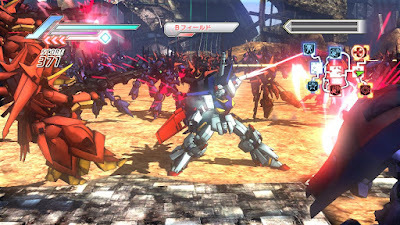 Mission Mode from past Dynasty Warriors: Gundam games returns to the spotlight with this third installment. This time there are a smorgasbord of mission types to select from. History missions focus on reenactments of battles throughout an assortment of Gundam series like Mobile Suit Gundam, G Gundam, Gundam Wing, Turn A Gundam, among many others. In Collection missions, clearing these unlocks rare mobile suit designs to add to your arsenal. Memorial missions unlock after achieving certain in-game goals such as taking down 100 ace pilots, for instance. of enemy mobile suits and take them all out. There are also plenty of other types like the more difficult Challenge missions, Friendship missions, Relation, and Special missions to do. You might think that with all of these mission types that you'll have a lot of variety in the actual missions you battle in. You'd be thinking wrong, however. Most battles in Dynasty Warriors: Gundam 3 play out in a similar fashion. There are different areas of the map to capture for your side (e.g. 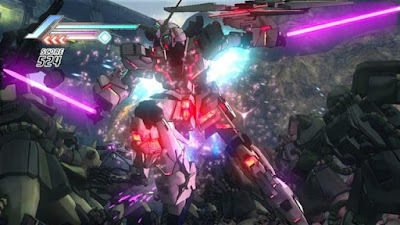 repair hangars to replenish health of allies, mobile suit factory to replenish your forces' gauge, and catapults that can send you across the map in an instant), and the aim of a typical Dynasty Warriors: Gundam 3 mission is to get the enemy forces' gauge down to zero by capturing their controlled areas and defeating rival ace pilots. The former is performed by destroying enemy mobile suits within a given area; thus lowering the control gauge. When it hits zero, your side has taken over control of that area. Don't mind me. I'm just upping my kill count. When the enemy forces' gauge empties, the commander of the forces enters battle. Defeating him or her results in a victory. The same thing happens for your side's defeat as well. If your side's gauge hits zero and you or your commander are destroyed, it's game over. It's only when you hit certain History missions that Dynasty Warriors: Gundam 3 offers any semblance of variety. Sometimes you'll be asked to take down 1,000 mobile suits. Others require the capturing of certain bases, while others are time limit oriented. These are so few and far between that you can't help but feel tedium rears its ugly head into the picture. Additionally, the progression of missions is often too confusing or worse yet, totally obtuse. It's not a good sign when there's an interface that shows what missions are available to proceed in the game, and it isn't always the most up to date and helpful. Many times I'd be cycling through my assortment of Gundam and mobile suit pilots, hoping I'd pick the right one to advance the story. you get a scene and engagement such as this one. The actual gameplay of Dynasty Warriors: Gundam 3 is done well enough. Mobile suits control tightly, and each have a nice sense of, well... mobility, about them. You can use a suit's thrusters to speed along the battlefield, though it can run out if used too much, requiring a quick cool-down period. 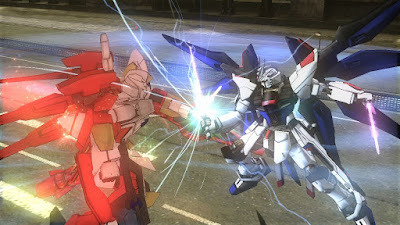 Essentially only two buttons are used for attacks, square and triangle, and these need to be alternated to perform the more visually interesting and powerful combos from each mobile suit. In addition to regular attacks, you can utilize a super-strong special attack or call in a partner for some temporary destruction by sacrificing some energy from your mobile suit's special gauge. Heaven help you if you end up in a battle in a close quarters situation, though. The camera is not well suited for these types of engagements. The Unicorn Gundam is burning red! Hey, that's Domon Kasshu's gimmick! After each battle, your pilot earns experience and can level up to a maximum level of 50. Each level earned grants higher stats like melee strength, shot strength, and armor strength. You also get mobile suits based on ace pilots you defeated and what suit you were piloting in that mission. Each boast different stats, and if you find a suit you really like, you can upgrade its slots with higher stats benefits for a price (each suit has a different amount of slots, and doing harder difficulties can grant you suits with up to 10 slots). This makes it where you can pilot immensely powerful mobile suits that can take down ace pilots like they were butter. 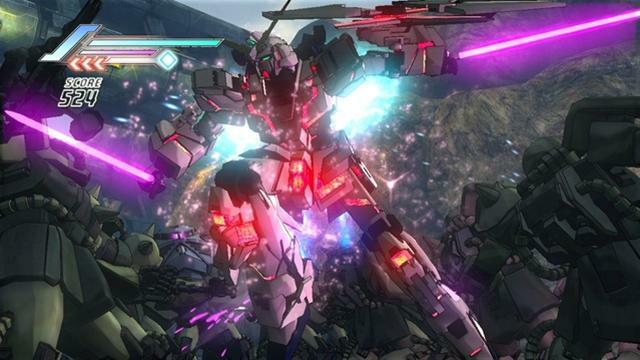 It's pretty satisfying like much of the gameplay in Dynasty Warriors: Gundam 3. That's why it's just a shame that the mission structure is so obtuse and the missions themselves seldom change things up. It makes Dynasty Warriors: Gundam 3 such a chore to play in extended sessions or even after a set amount of hours of total play time. Yes, the gameplay is still the good old fashioned Dynasty Warriors that fans of the series can enjoy, but the lack of mission variety hurts the game tremendously. Mission abort! Thanksgiving is this Thursday, so SuperPhillip Central is delivering a healthy plate full of VGM goodness. We start things off with some timely Killer Instinct: Season One music, and then we go a bit retro for three VGMs with music from Resident Evil, Teenage Mutant Ninja Turtles II: The Arcade Game, and Mighty Morphin' Power Rangers. 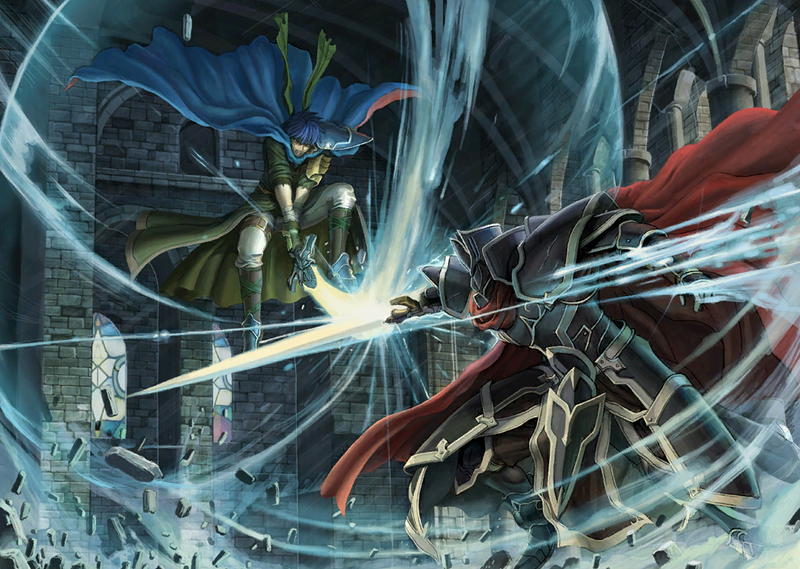 Finally, we wrap this nutritious and delicious edition up with music from Fire Emblem: Path of Radiance. You can be sure there are no turkeys here! Check out past VGM volumes with the VGM Database at this link! Now, onto the VGMs for this week! Let's get tribal to kick things off with this edition of SuperPhillip Central's Favorite VGMs. It makes sense to start off with a track from Killer Instinct's reboot, as that game is two years old now! 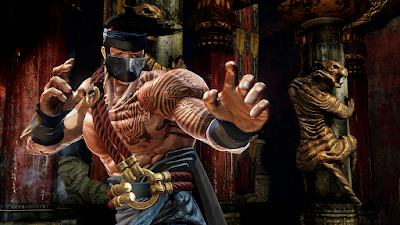 In fact, with the December update, a new UI and a shadow version of Jago, the subject of this VGM volume, will be released. What a perfect way to welcome both than with this VGM! Smile and say cheese! No, really. 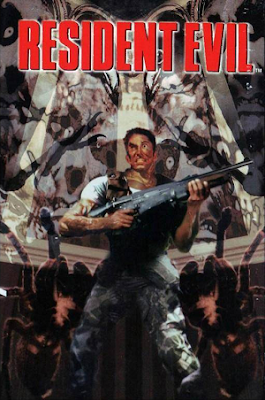 This ending theme for the survival horror classic that started it out is pure camp and cheese, much like the acting that the original Resident Evil was packed with. Like one of the YouTube comments says, it really does sound like something that would play at the freeze frame of a 80's movie. We're going even further back into the past with this NES classic, Teenage Mutant Ninja Turtles II: The Arcade Game. 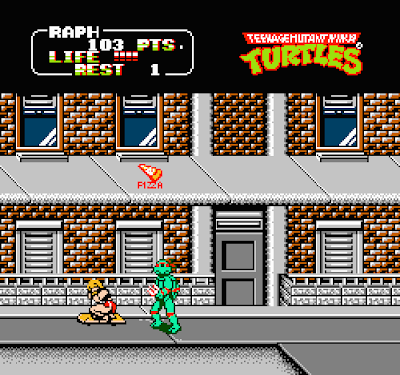 Obviously, the subtitle tells us that this game is a port of the highly popular arcade game, but what it doesn't tell you is that the NES version housed a couple of extra stages not part of the original arcade game. The visuals and sound may be less impressive, but the extra levels more than made up for it. In the Beat-em-up special edition of SuperPhillip Central's Favorite VGMs, we brought up the Mighty Morphin' Power Rangers movie as one of the games. 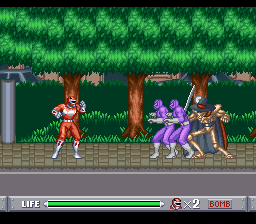 This time we look at the original Mighty Morphin' Power Rangers game that was more nonlinear in the fact that you got to choose which Power Ranger you wanted to play as, each with his or her own level to go through. We finish off this edition of SuperPhillip Central's Favorite VGMs with one of the GameCube's more valuable releases cost-wise. 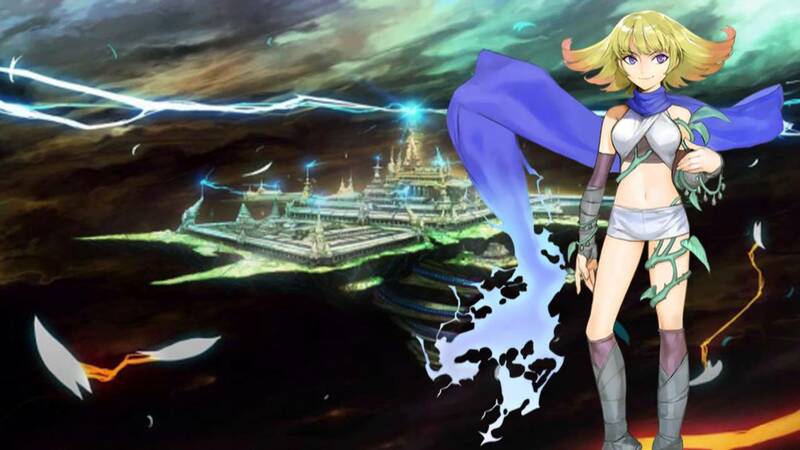 It's Fire Emblem: Path of Radiance, part of a series that is no stranger to SuperPhillip Central's Favorite VGMs. The soundtrack uses synth symphonic sounds to deliver a tense and action-packed soundtrack, such as this theme that plays when going against Path of Radiance's main villain, the Black Knight.